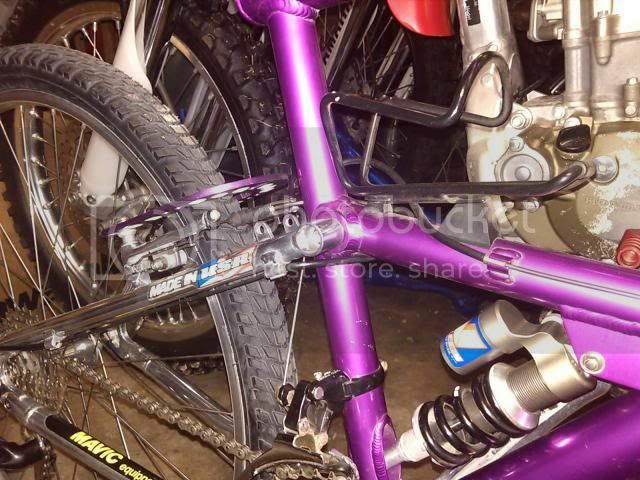 Post subject: Purple Ano GT RTS....rare?? 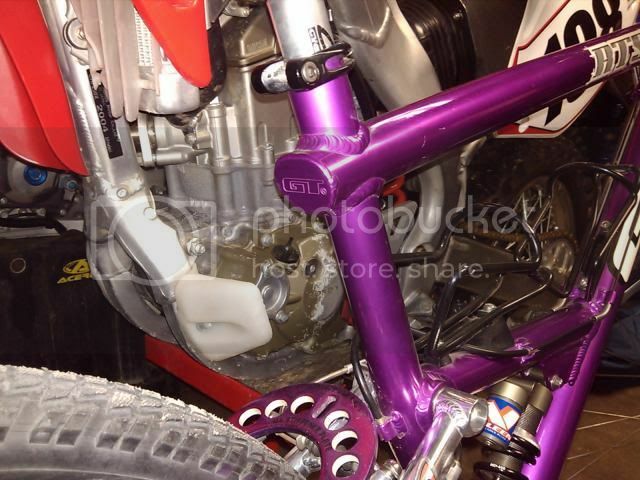 So, I've been looking around trying to find more info on this purple ano RTS frame I have, and it seems every time I start reading about one it turns out to be one of the powder coated frames. There doesn't seem to be a lot of info out there. Are they a rare item? The main thing I'm curious about is what sales year/s were they made for and were they made for the frame only market, or were they built up as well? Mine is a USA built anodized, no question, but it doesn't say RTS-1 or Team or anything, it just says RTS. 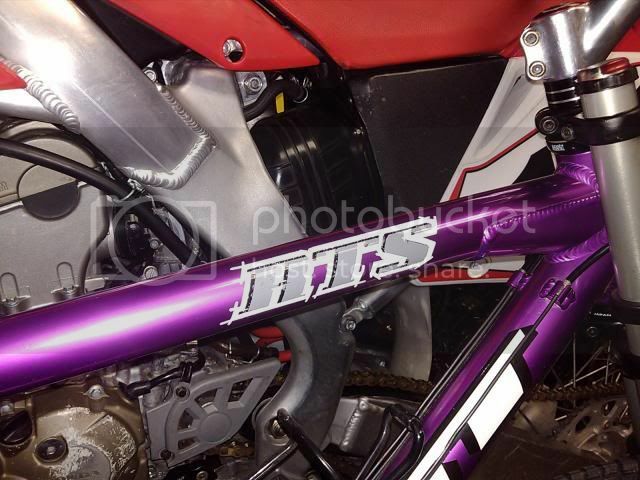 I bought it new as a frame only that had never been built so I'm thinking that might be why it just says RTS. I know it's a 16" that was made in '94(ser# 01943853 16), but I bought it in '97. It has decals like the earlier frames circa '95. It was obviously a left over that didn't sell once the early '90's purple phase had started to fade. I bought it cheap to build something for the wife, so I didn't care if it was purple, she loved it! Anyway, I've been going through our old bikes, getting them running again, and I've been looking up info on all this old stuff I have. Interesting to see I have a few hard to find items. Anyone know any details on these purple ano RTS's? Here's how it looks for now. It's all mid '90's LX 8 speed with a Girvin Chubby fork that needs to be replaced with something else. I'm thinking about a Rock Shox or Marzocchi fork from the mid to late '90's and call it done. Post subject: Re: Purple Ano GT RTS....rare?? I'd say its had new stickers as it should say RTS 3 I think ? As far as I am aware it was the RTS 3 that came in purple first . Look nice though any cracks in the swing arm or rocker mount ? RTS-3 would be a Taiwan bike and powder coated, not anodized. If anything, this would be an RTS-1. The stickers are what was on it when I bought it. I don't imagine the bike shop would bother changing the stickers back when this was new. No cracks on this one. 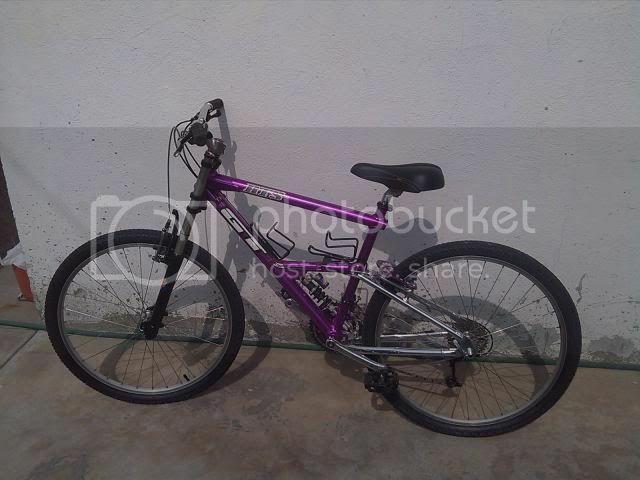 The frame is about as close to excellent condition as you can get for a used bike. I think my wife rode it maybe three or four times, and only once in the dirt. lol!! Hopefully we'll be getting back into riding on a regular basis and it will finally see some pedal time. I think is a RTS-1, if it were a 2 or 3 did not has that serial number, my opinion. BTW, good looking bike, I like it a lot, put rockshox. Anything on it that says what it's made of? OK, went out and took a few more pics. I couldn't get a good shot of the ser#, it's covered by the swingarm. I did get some other tell, tale shots though. If it's made in the USA and with the flat cap (it was) its a 1. Lovely bike. Would love one myself. I saw one on ebay a few months back. It went for $350 I believe (frame only). Great looking bike. Wow, so are they that hard to find? Or was it a super clean NOS frame? You remember what year it said it was?